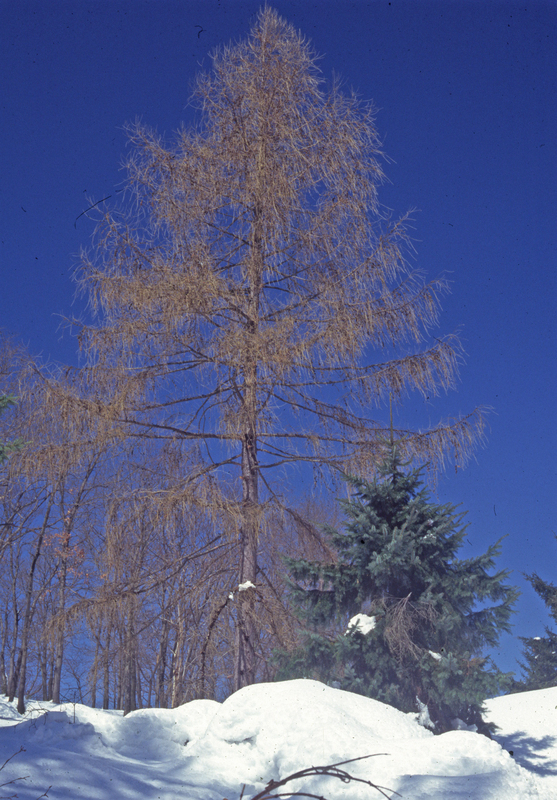 There are perhaps 11 species (taxonomists may differ) within the genus Larix, or Larch, all occurring in the northern regions and/or higher altitudes of the Northern Hemisphere. 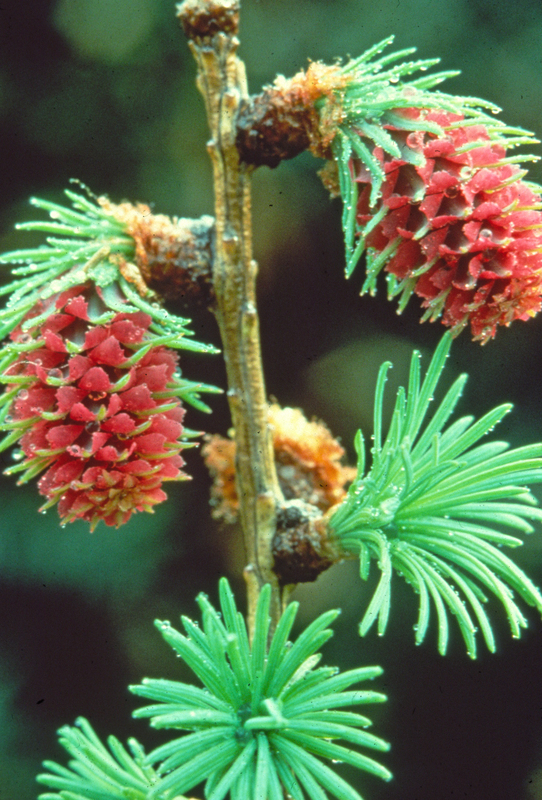 Cone characteristics along with geographic nativity help greatly in distinguishing between species. 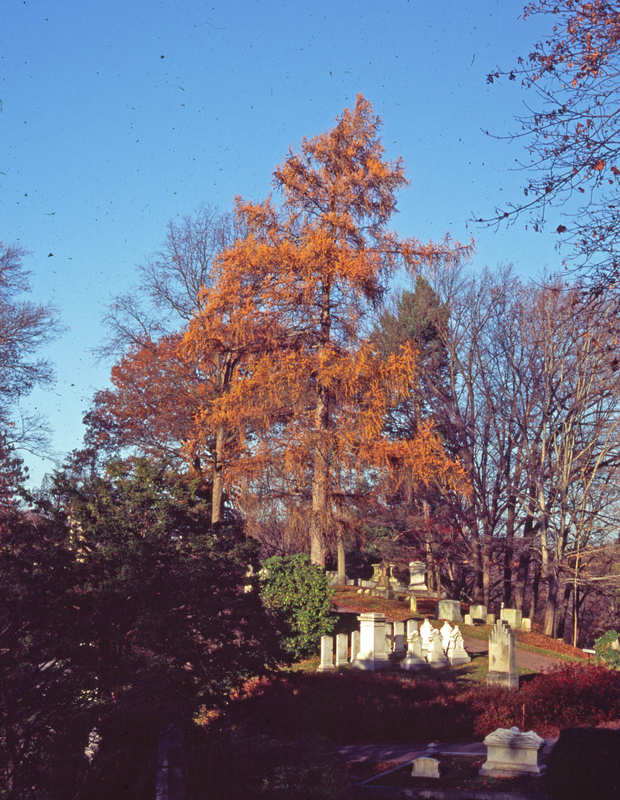 Sixteen European larch, Larix decidua make up the majority of Mount Auburn’s larches. 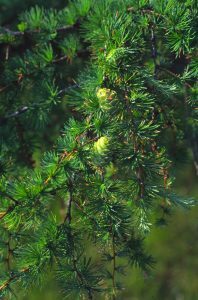 These are native to northern and central Europe, including The Alps and Carpathian Mountains. 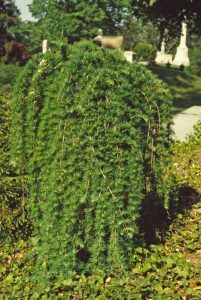 Reaching 70’ to 75’in height, The Gymnosperm Database lists the tallest known one at 173’ high, in Germany. The same source cites the oldest known European larch, Larix decidua being 986 years-old, from tree-ring collection, although most trees would be notable to live one-fifth that long. The leaves are needles, the slender leaves of many conifers. 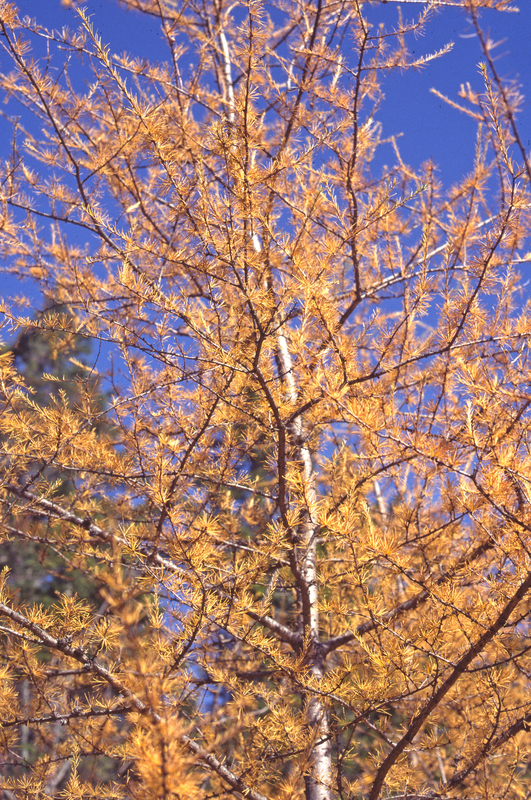 Larch needles are ½”-to-1 ½”-long, growing in spiral clusters. Many clusters of 30-40-needles together are borne from short shoots (spurs) found along the branch stems. 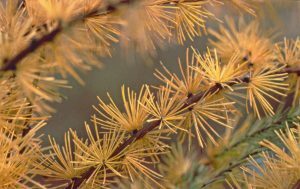 In late October, these needles turn yellow, sometimes with a golden glow, appearing to be lit from within. 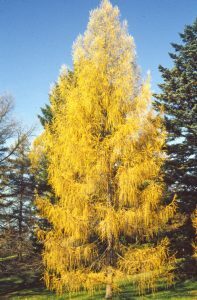 Next and all winter long, the trees will be leafless. 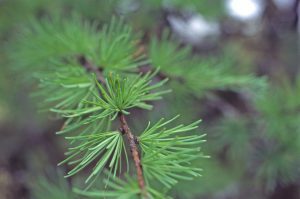 The new, next season’s needles are often some of the earliest leaves to emerge in the spring. 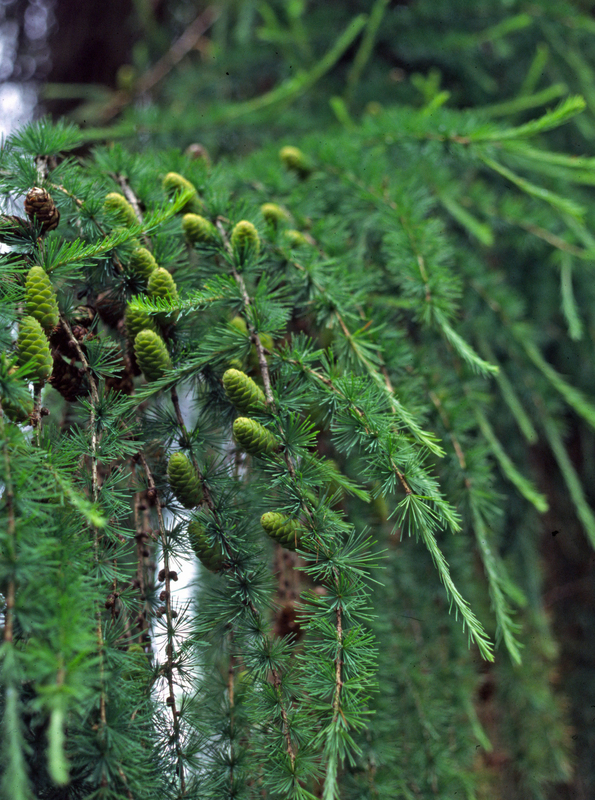 As with many conifers, larch produce separate male and female flowers (strobili). In early spring, small, yellow, male strobili along the branches produce pollen. Nearby red, pink or green female, ½-inch-long strobili if successfully fertilized will change to brown and develop into one-to-two-inch-long cones, carrying the seeds for the next generation. Crossbills, purple finches, kinglets, along with other birds eat these seeds. Some of these cones may persist on the tree longer than one year, and are a good winter identifying characteristic. 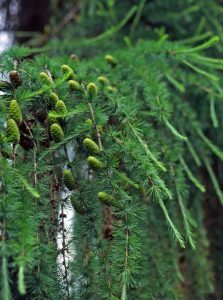 We also have growing here two specimens of Dahurian larch, Larix gmelini, native to eastern Siberia and north-eastern China. 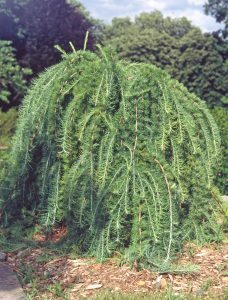 The species name honors Johann Georg Gmelin (1709-1755), German naturalist, botanist and geographer. Similar in leaves to the European larch, this species has smaller cones and can survive in temperatures of -40 to -50 degrees (Zone 2). 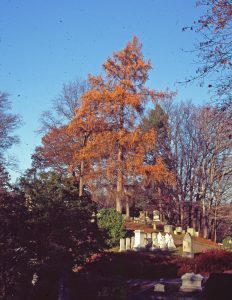 On a late October visit to Mount Auburn seek out some of our larches on Chestnut Avenue, Magnolia Avenue, Laurel Avenue, Sparrow Path, Alyssum Path, Pilgrim Path and along the Grove Street fence near Bluebell Path, among other locations. 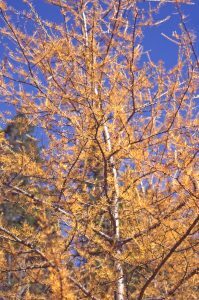 …LOVE the Larch! 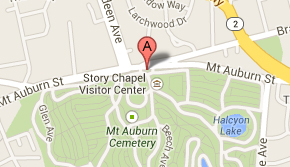 Thanks Jim.